Under two weeks, from start to finish. That must be a record for me, as I am more like the hare than the rabbit. Granted, my New Big Leaf is a small project — but hey, every finish counts, right? I started this on Oct. 28 in a workshop with Pat Pauly, a renowned fiber artist from New York who came to Portland to teach her “New Big Leaf” design using freezer paper templates. A week later my top was pieced. Now on to the quilting. I used variegated threads that blend with the background, the goal being to add texture without adding color. I finished hand stitching the binding Tuesday morning, 13 days from the day of Pat Pauly’s workshop. What a triumph! Oops, not so fast. Now comes the confession: my project is not truly finished. Did you notice? No label on the back yet. And no name, for that matter. I was so eager to show it to you that I fudged a bit on my pronouncement that it was done. I am still musing on a name. As for the label, I’m thinking about making one in the shape of a leaf, using the freezer paper technique I learned from Pat. Wouldn’t that be a fun touch? Linking up with Kelly of My Quilt Infatuation on NTT (Needle and Thread Thursday). It hardly seems possible but eight months have passed since I last worked on Sun Flowers, pictured above. It’s the third of four kaleidoscope wall hangings I’m making of my Season to Taste pattern — one version for each season of the year. This is the summer version, made from a lively floral print from Camelot Cottons. 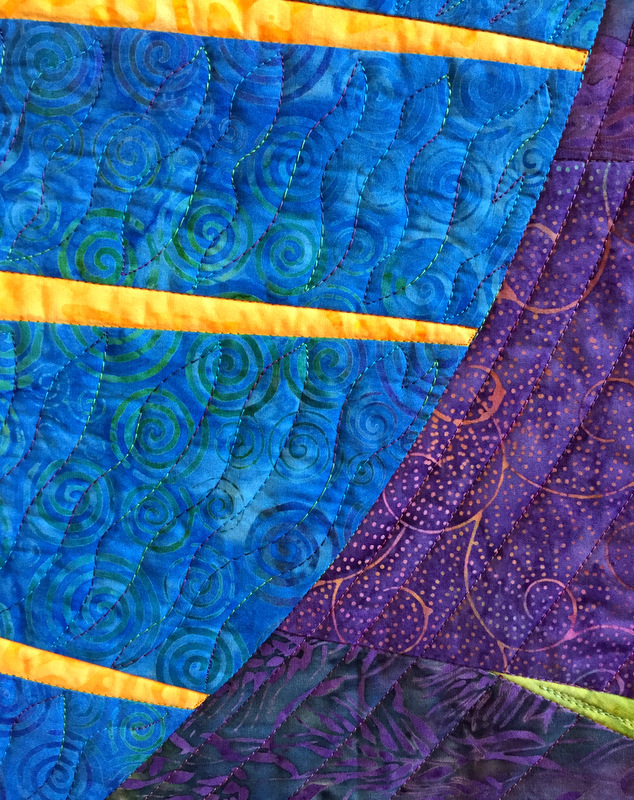 I love to feature the focus fabric on the backs of my quilts, especially when I’ve used it to make kaleidoscope blocks. It’s a cheerful and colorful addition to the Portland White House. On the greyest of days in Portland — and we have many of those in fall and winter — it will be a spot of sunshine. The next decision is whether to add a binding or face the edges. I’ll wait till it’s quilted and then let the quilt “tell me” what it needs.